CBS Television Distribution has announced that The Arsenio Hall Show, which airs in first-run syndication, has been picked up for a second season. Hall received the news while he was on the air, via a surprise appearance by his friend Jay Leno. This is Leno’s first on-air appearance since leaving the Tonight Show earlier this month. Towards the end of the appearance, Hall asked Leno to return at some point as a guest comic. What do you think? Have you watched the new Arsenio Hall show? How does it compare to the other late night shows? Deadline has just reported that CBS Television Distribution has decided not to proceed with the second season of “The Arsenio Hall Show”. Effectively, it’s cancelled. I love Jay Leno. 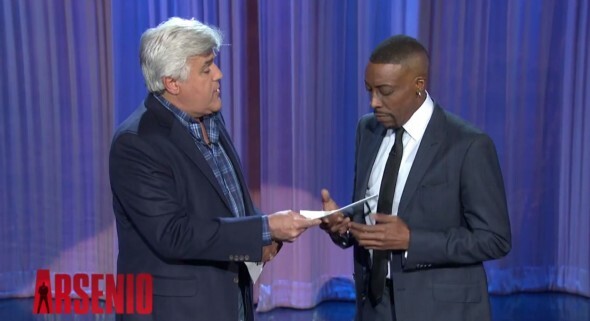 It’s cool he broke the news to Arsenio regarding the show renewal. I am so very glad Arsenio’s show is renewed. I love his show a lot!. He is a great late night talk show host, actually my favorite late night talk show host. I hope his show will be renewed for the next 20 years! if that’s possible.